I am VERY happy that you guys loved the flea market post last week, so in the name of the “business,” I ditched parenting on a Sunday morning, again, for the flea market and accidentally bought like 15 things for the mountain house (and some for here). I went to Downtown Modernism, a bi-annual flea market with vintage dealers that is much more curated than the Rose Bowl and IT WAS SO GOOD. The vendors are so good, and while I’ll say that it is more expensive than other markets (though not by much), anything you find here is likely to still be FAR cheaper than stores. So today, I wanted to take you through what I picked up and why (and stay tuned for the end of the post for our Get the Look of similar vintage pieces). I walked past this table, was very attracted to it (despite being covered with other garbage) and thought about it for two hours before pulling the trigger. It’s SO BEAUTIFUL and solid (probably over 100 lbs) but I didn’t know where it would go. Right now, I have an excess of coffee tables up at the mountain house and while this one is solid, it may not be THE MOST functional for board games, drinks, etc., because it has a lot of organic holes and I can see Brian being annoyed which often isn’t worth the battle. But then I realized that we have two EXTERIOR living areas—upper deck and lower deck—so I rushed back, excited I mentally found a place for it and bought it. It was $500, which isn’t cheap, but at a retail store in LA, it would be FAR more. It’s substantial and a really great organic/modern piece. Normally, these kinds of tables are a bit orange-y (sometimes really orange) but this one is super grayed out. It doesn’t look flat on top in that picture above, but it is. Here you can see why it might be annoying indoors for our family, but I might try to convince Brian. (I also have my Saarinen coffee table which is admittedly a little boring, but it’s kinda the perfect Play-Doh game table that is really family friendly, so heavy and easy to clean). Next is this trunk that MIGHT have been a mistake, but my love of a vintage trunk goes on and on. 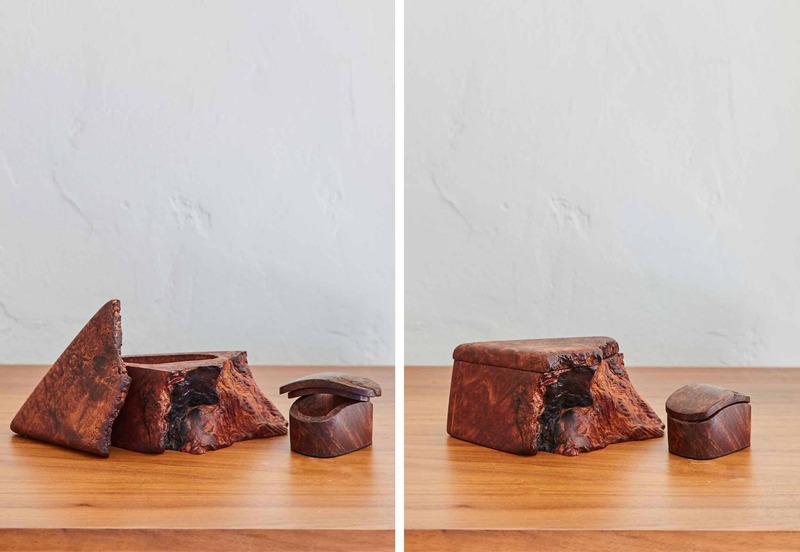 Here’s my case for it: This one can be propped vertical or horizontal—so it can be a cute vignette with a lamp on it—or you can use it at the foot of a bed or as a coffee table, etc. But why I bought this was because of the inside…it’s such a great, functional steamer trunk for any future transcontinental boat trips. I am going to put it in the kids’ room and it’s just such a fun treasure box, with fully functioning drawers and hangers. It’s obviously great for guests, too. It’s a dark green/blue, and with brass and black accents = perfect. It wasn’t cheap either ($250), but the vendor took Venmo so I just went for it. Part of me is concerned that it is too “junky” and “antiqued” for the aesthetic of the mountain house, but the other part of me is like OR IS THAT WHAT THIS HOUSE NEEDS? 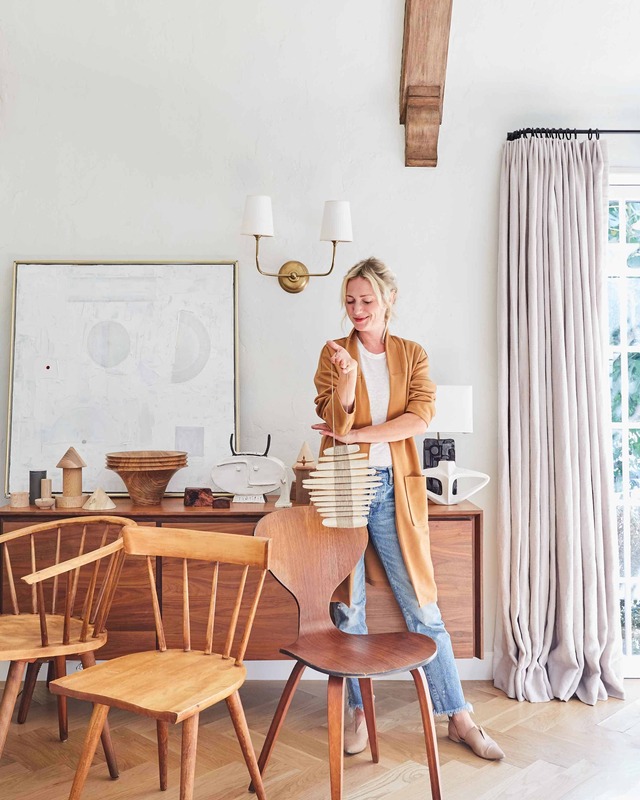 Every mountain house has a collection of antiques and while I don’t want this house to be too eclectic, I love a good trunk and pretty always looks good with pretty. We’ll see. Now on to all the smaller items. First off, that painting above is one of my favorites EVER. It’s by artist Melinda Forster who was there manning her own booth. She made the lamp, the white sculptures and the white painting. It’s so quiet, but large and high impact. It was $280 which I thought was a score for a large piece of original art. The rock and twine hanging sculpture was a friend of hers, Amy Dov, who’s also a current artist. It was a splurge, I think around $300, but it felt perfect for the mountain house. I’m picturing it in a bathroom. And yes I know that is a lot to pay but it’s supporting a local, current artist and when you can support someone else’s talent and art, you do/should. The lamp by Melinda Forster is INSANE. It’s so special. I’m obsessed with it and everyone who sees it wants it. The vase next to it is vintage and was $25. 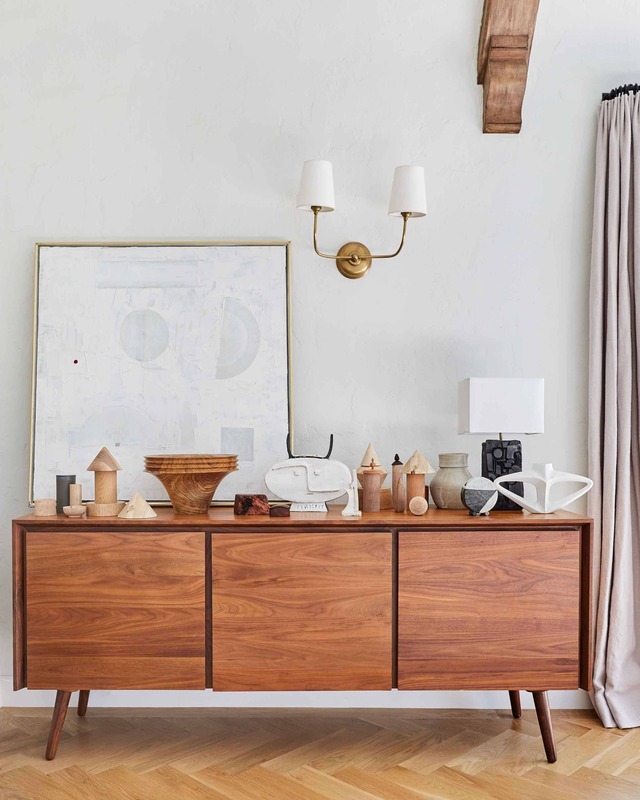 It’s special and weird and I probably didn’t need it but I often find that “horizontal sculptures” are hard to come by when you are styling out, say a credenza. That piece stands alone because it’s big and wide enough, but it’s not visually heavy. This guy made me smile immediately. 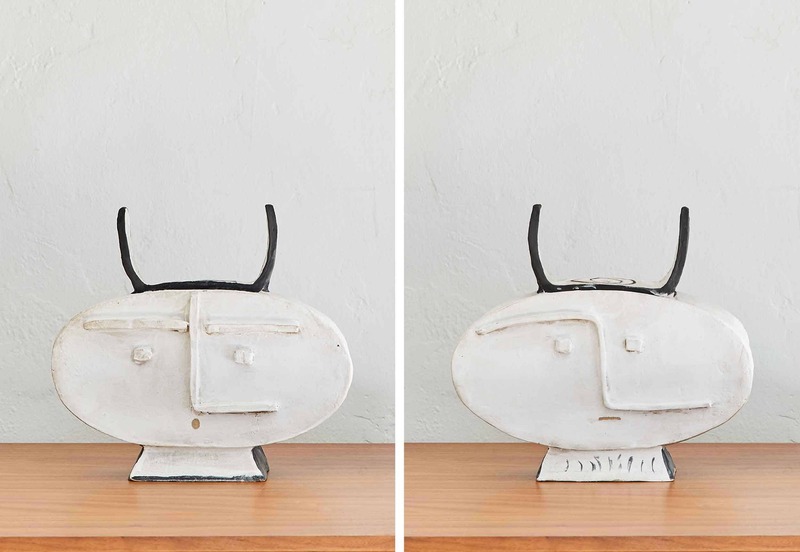 It is that sculpture that is just so special, has a ton of quirk and character (this is a look at both the front and back…or maybe it’s the back and front…so many options!) and makes me smile. It reminds me of old Emily, but a bit more sophisticated and quiet. It’s also by Melinda Forster. I apparently really like her work. It cost $280 but it’s full of personality, big, totally unique and a conversation piece. A pretty white pottery vase for $35 isn’t something I pass up. It’s on the big side, too, and I’ll use it over and over. 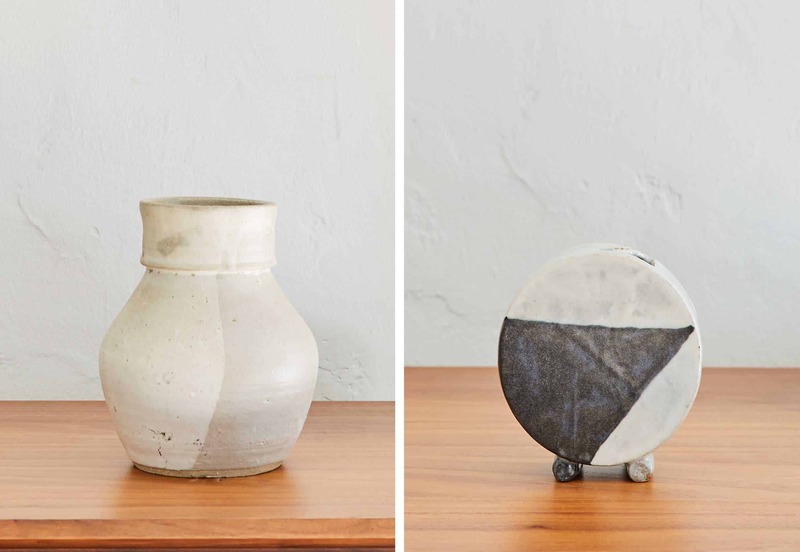 The footed black and white geometric vase felt like the old me meets the new me—still some whimsy, but less in your face than I used to be. Onto the wood pieces…because lord knows I NEED more sculptural wood objects or boxes in my life. These were handmade boxes from Mexico. The larger one was $35, smaller $25. I thought that they would be lovely gifts, not that I’ll part with them, but that was the intent when I found them. Brian thinks they are for, ahem, medicinal herbs, but I’ll probably use the small one for rings. The big pretty wood bowl was a gift from a really nice vendor Valiant Vintage. He was holding a chair for me and his nephew accidentally sold it while I was getting cash so he gave me that pretty bowl as an apology and I tried to not accept it, but he insisted. I was going to buy it anyway. 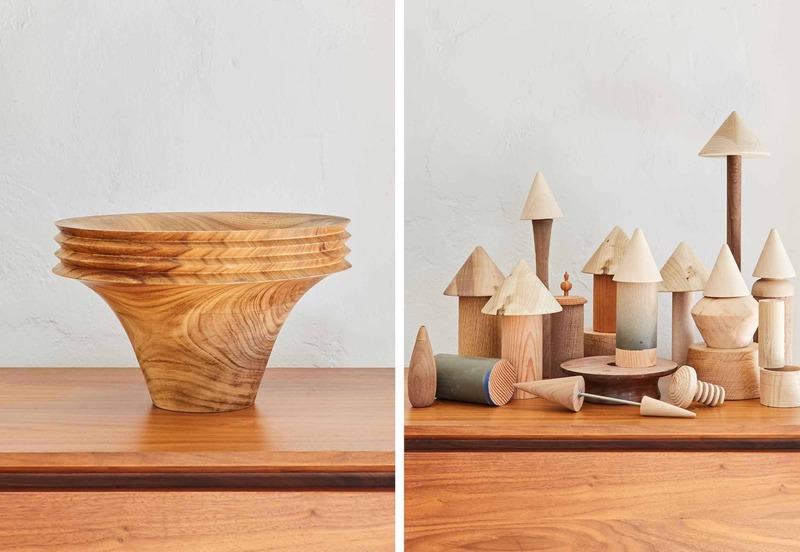 Then there is the unnecessary collection of architectural wood pieces. I just couldn’t NOT buy them, but what and why and where??? My kids are already so obsessed with them and making me feel less guilty about the hoard. Don’t get me wrong, I LOVE them, I just already have two different collections of wooden sculptures so no, I didn’t need them. Now we head into the collection of dining chairs that seem like an unnecessary hoard but it’s not. 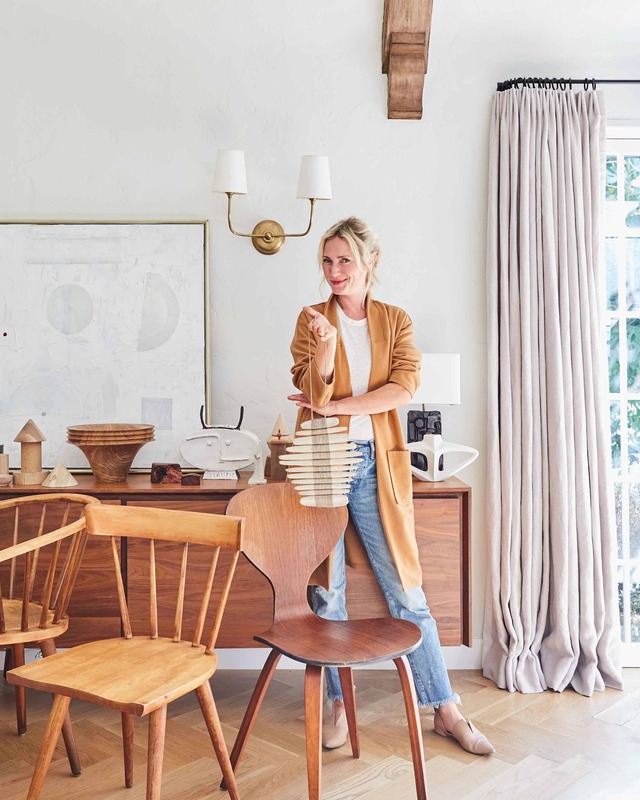 I’ll now present to you my rationale for buying so many different vintage chairs: I love the look of a mismatched dining chair moment IF they are all awesome chairs and if the room can handle the busyness. 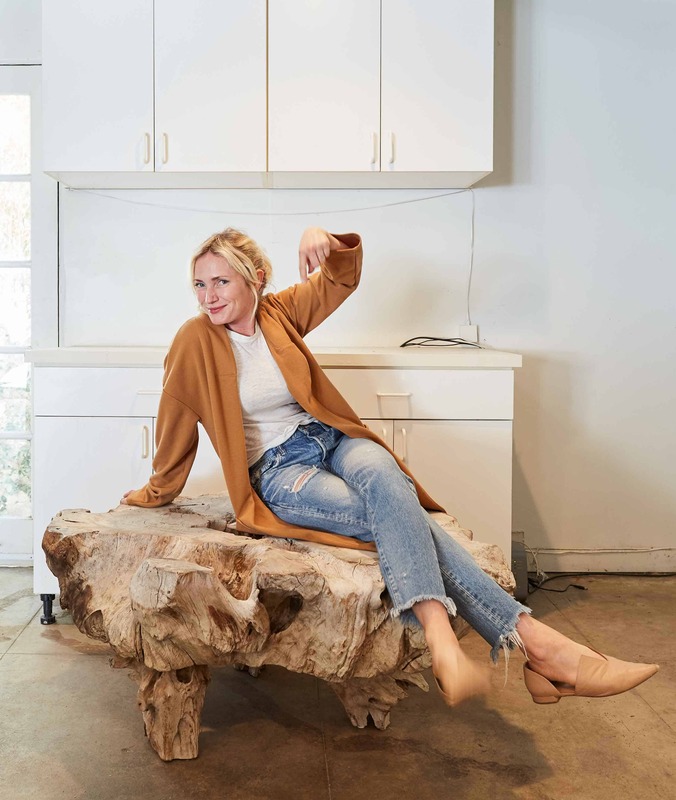 Our dining room in LA can not because of the proximity to the counter stools, but at the mountain house, we have a big built-in banquette (or will someday) that will cover three sides of a table and we’ll want floating chairs for the other 2-3 seats. I think it could be a good place to bring in a few vintage chairs that are AWESOME and special, that have pretty backs. 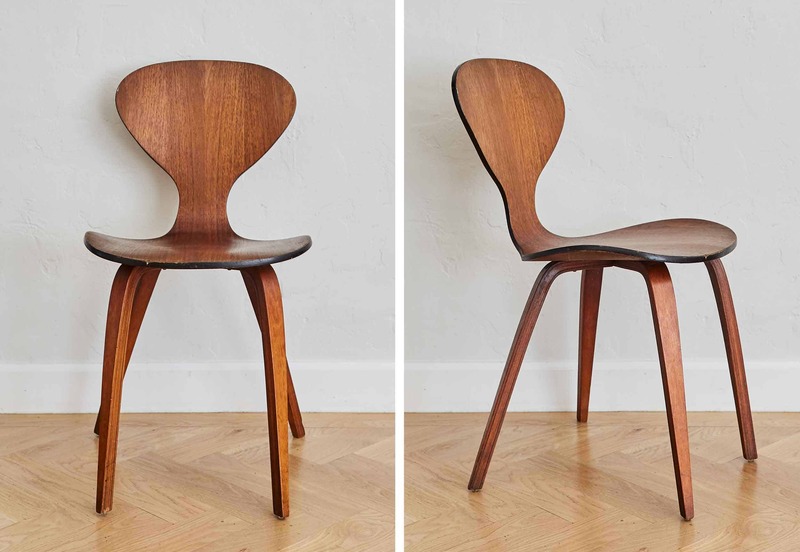 But even if we don’t do it there, I have a thing for a single BEAUTIFUL sculptural chair, so I hoarded one Cherner, two Paul McCobbs and one mid-century-style Windsor chair. The Cherner was $100 which is a steal, but I’ll admit they are pretty fragile. I just couldn’t pass it up, though!! I figure even if it just sits next to a credenza or dresser or in an entry, I’ll be happy. There’s no beating that shape. Lastly is a really pretty bucket-style Windsor-esque chair. It’s SO GOOD. This is another one that looks great on its own, but I think will mix in nicely as a set. It’s just beautifully made (and was $125). The first piece I saw when I walked in that I loved was this chair and ottoman. I’ve had my eye on this Thonet on Chairish with similar lines, but this one has upholstery and an ottoman. I love the squared off shape, the caning on the back, and the detailing of the joints. It doesn’t NEED to be recovered but it would be so much prettier in a light linen with leather straps for the head pillow. OH AND IT RECLINES. I kinda hoard chair/ottomans because I feel like so many corners beg for them. We have so much space to fill in the mountain house and while we are bringing some of our pieces from LA (and switching things up here because of it), we just need a lot up there, so when I see a $500 chair and ottoman set that is special, comfortable and in the style that I want (and totally unique), I snag it. There you go, my loot—mostly splurges, but some scores. It’s a lot, I know, but it’s SUCH GOOD STUFF and if some of them don’t work, I feel confidant they will work in a project that we have this year (I’m doing three of my friend’s houses and I can see things working). The rock and twine hanging sculpture makes my heart sing! To be honest though, these are all beautiful finds. All the chairs. Just, all the chairs. And the rock sculpture – so much. I LOVE these flea market posts. Ditto. More flea market shopping! I LOVE IT. I will say the ‘get the look’ is really great, but for me it is mostly inspiration for local vintage hunting. 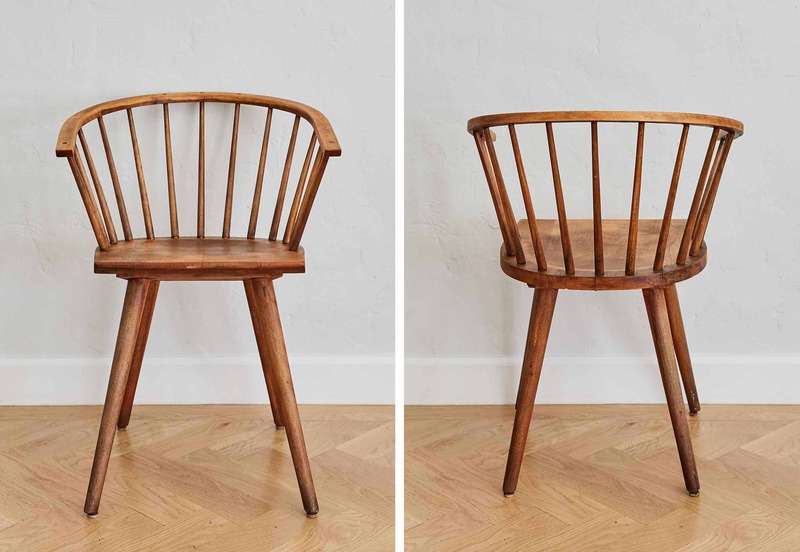 Also, one suggestion: if people get bummed about not being able to buy the vintage equivalents (say the Chairish items are sold out when they click through or that they can’t afford vintage cherner chairs) maybe you could add a ‘get the look’ with new pieces (like Target florence dining chair as a substitute for the windsor bucket chair for example). Ditto! Flea market posts are my favorite. That table?! Cries salty jealous tears. Also, that black lamp is gorgeous. Love the flea market posts. Love this kind of article ! More more more! I love love these posts. It’s almost winter in this beautiful country we call Canada AND I have a newborn so my thrifting opportunities will be minimal til Spring! I love seeing these things through your eyes Emily! I would totally steal that black lamp…the texture and color are stellar! My own tastes run more global/bohemian with clean lines and neutrals and a lot of these pieces would be perfect. I love these posts! I used a steamer trunk very similar to the one you purchased to hold all my jewelry, belts, and accessories. The hangers were perfect to keep long necklaces from getting tangled and for my scarves. You won’t regret buying it. It will be great for dress-ups or fun little toys in the kids’ room. Those chairs are such a great find. In great condition, and the prices are on point. I can’t believe that you got the chair with the ottoman for $500. Well done! you should definitely do linen and leather straps, on the pillow but also on the bottom of the ottoman cushion. Love these even though we don’t have flee markets like these. I am so jealous. Love these posts!! Love the beautiful art, what a great find!! Love love love! That lamp is fantastic! Please keep these coming! So, I am pretty sad that I did not know about this flea market sale… I’ve tried to look up dates for the next one but cant find any dates in 2019. Their website is still advertising for the October one. Do you know when the next one is? Will you post it on your site/insta stories/etc next time? It’s so much fun to spend your money instead of my own 🙂 Gorgeous finds – will be a treat to see what you all do with them. Fun post! Everything is absolutely amazing. Well, except (sorry ducking …) I just don’t love the “herbal boxes.” The shape and color is just OK, a little “meh”. Disclosure: I have never bought anything at a flea market. I have a history of changing my mind and could never buy something you can’t return, too much pressure, and I’d probably make a huge mistake … that would haunt me for the rest of my life, sitting in the corner, mocking me: “remember when you spent hundreds of dollars on me because you thought I was hip and would make YOU hip by association…. (evil laugh)”……. Putting that big ‘ol coffee table outside. Genius! You will love it for years to come. OH MY GOODNESS! Don’t question a single one of these!! They are all stunning and a steal if you ask me. And yes! we are all so happy to see a bit of a return to old Emily – actually best of all is old/new Emily. Thanks for everything – truly. Digging eeeverything except that steamer trunk. My faves are definitely that coffee table, the white simple vase, and the Windsor-esque chair (they’re my favorites because I could picture them at my home, and because they seem sort of California Casual to me, in a good way), but also I’m favoriting the geo-vase and the Melinda Forster lamp (because they seem very stylish, even if they wouldn’t work at my specific house). I am so excited you got that great Borge Mogensen reclining chair and ottoman!! Cant wait to see how it ends up styled. You got some AMAZING things. For me the standouts are that trunk (so incredible, please do not give up on it), the wooden bowl that was gifted (what a sweet gesture) and the recliner and ottotoman (please recover them just as you described. It would be amazing with the leather straps and linen). This post makes me want to come to CA just to visit the market. Such bautiful things. These posts are literally the best. I love your style. Please keep these types of posts coming. It feels like “old Emily” with a mix of “new Emily” and that makes a perfect match!! That stone and twine art piece is magical. The chairs are beautiful. Everything is awesome! I really like seeing things like these – they broadens my design world and help me appreciate styles that might not be in my immediate wheelhouse. Thank you thank you thank you! I’m one of the ones that had asked for a return of the flea market posts and I love seeing them (especially as our gut reno has reached the point that two mortgages, taxes, and contractor overruns and miscalculations have become so painful that I didn’t go to the flea market on Saturday. I appreciate the vicarious shopping session this morning at work!)! Our styles are pretty different, but I feel justified by your beautiful but rickety chair purchases! I bought a beautiful but not structurally sound french fauteuil a few months ago just to put in the entryway – no! don’t sit, just look (not that anyone would sit in it as there is hay and horsehair coming from a hole in it). I too have a thing for chairs… So glad you had a fun Sunday! Love all of these picks Emily! Your taste is impeccable as always. 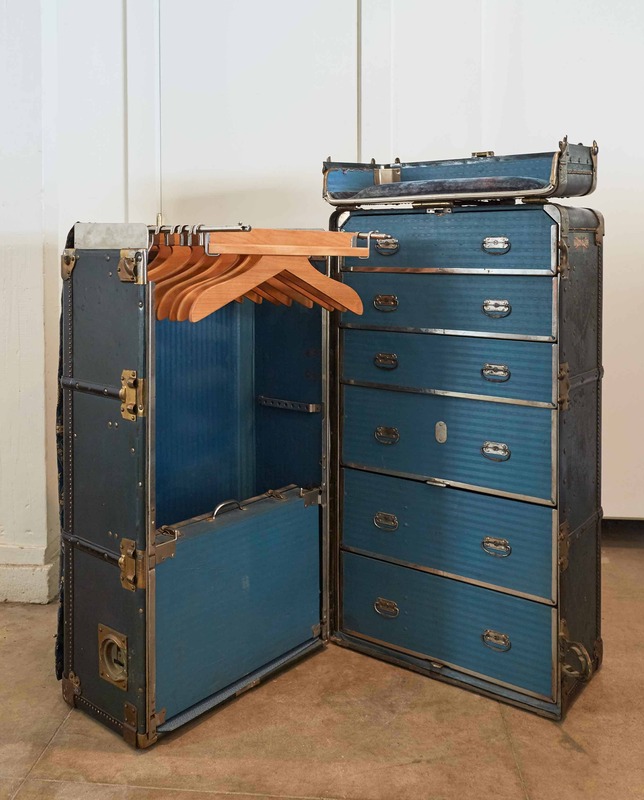 I especially like the idea of using the steamer trunk as a magical toy chest. Thanks for sharing the weird and the wonderful with us. That black ceramic lamp reminds me of a Louise Nevelson sculpture. Good stuff! Love these flea market posts. 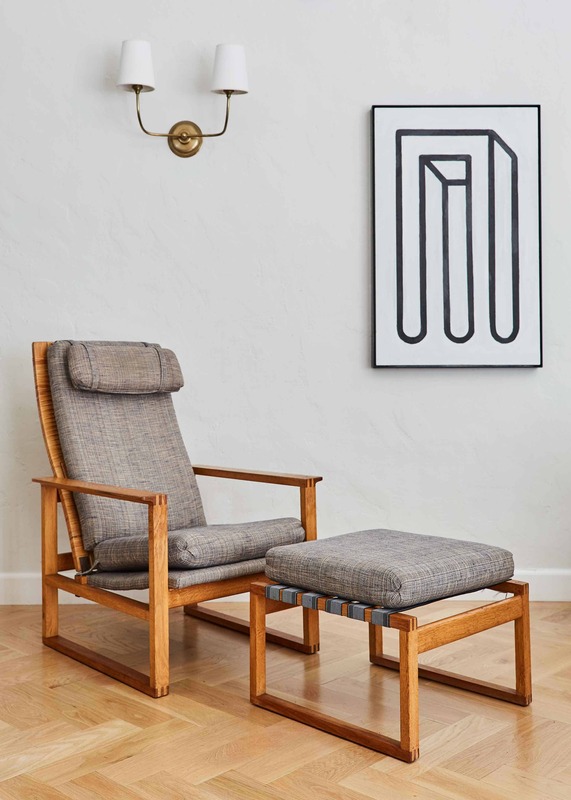 the Chair and Ottoman look very much like BORGE MOGENSEN!!! If it is Borge Mogensen then it was a real real bargain! I love every piece! it is !!! I forgot to mention that. YAY! I think my favorite thing about this group of things is the feeling of real-ness they exude. (and they are also beautiful!) Even in a photo it’s apparent and has such a different vibe than a collection of spanking new things. Soul, as you say. I absolutely see why buying vintage is worth it. Ah, thanks. its so true. I love love love these posts. I’d also love if you had an eventual tutorial for someone who doesn’t live in a huge metropolis but still would love ideas on how to thrift/flea in a reasonable way. I live in Omaha NE and it’s the biggest city in our state but there’s nothing like what you’ve described having in LA! Maybe a guest post from someone who lives somewhere else on how they thrift/flea? Ha! And I’m always thinking how good the thrifting is on the East Coast…at least the prices seem better there to me. Maybe it’s because my style is really not “modern” and see more of that here. People in California were more open to the modernist items when they were new, so there’s just more of them here being sold? My artist uncle’s style was very much this, and a lot of these pieces remind me of his home in the early 60s. I agree, thrifting in LA just seems to be a whole different ball game than in the midwest! One of my favorite blog/Instagram accounts is The Makerista, shes from my hometown of KC and has a series of blog posts about how she thrifts to find good stuff. Would be fun to hear from guest bloggers like her on how they thrift in their areas and what kind of things are easier or harder to find in their part of the country. If you did a YouTube segment or some video of you just scouring flea markets… I would literally watch it all day! Love these posts so keep them coming! Man-oh-man. That is a GOOD haul. I want every, single, thing. And none of the art is overpriced — those pieces would have been much more in a gallery and they are all special. Love these posts! Yes to the trunk at the mountain house! A mountain house needs some time-worn history, right? Have you considered putting a piece of glass on top of the wooden coffee table to make it more functional? Remember to take off the mechanism on the outside of the truck, if you put it into the kids room. They can get shut up inside and not be able to get out. I’m loving all those neutrals together on your credenza HA! I’m jealous of your new coffee table. I’ve been searching for one myself that is redwood. I’m sure you’ve considered adding a glass top. I love these posts. If you are looking for ideas then how about a round up of airy shelving or bookshelves for smaller spaces. Especially in narrow rooms where you see a side of a bookshelf when you enter the room. omg I love vintage splurges and finds. Thanks for this post! Makes me feel that even if I shouldn’t be doing it, at least I’m not alone in buying these wonderful, unique items FOR SUCH A DEAL. 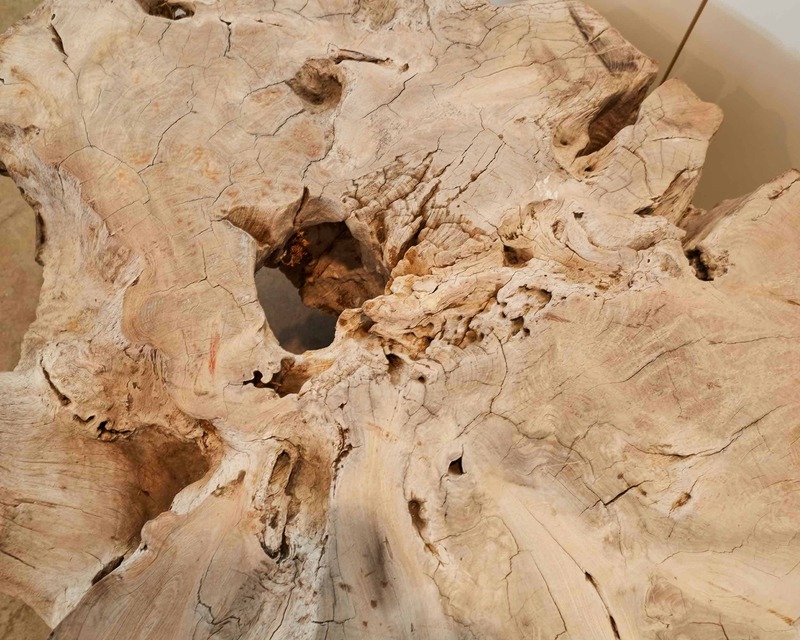 The tree stump table has to be my favorite. It’s just wonderful. And all of these precious things, they’ll make you smile when you look around the room. Plus, this s*&t has survived to reach the vintage market — so it’s probably pretty tough and can stand up to kids and a mountain house, right? I love every single piece (except the steamer trunk) but I live in southwest Missouri and most thrift stores here are essentially indoor garage sales with early 2000s pre-watched DVDs, overstuffed La-Z-Boy recliners, and half-burnt candles. Any suggestions for thrifting in less-urban areas? I’d love to see a return of the Craigslist finds from random cities, maybe updates to Facebook marketplace? Or even some primers on what to look for when you’re sorting through all the junk! Thanks! 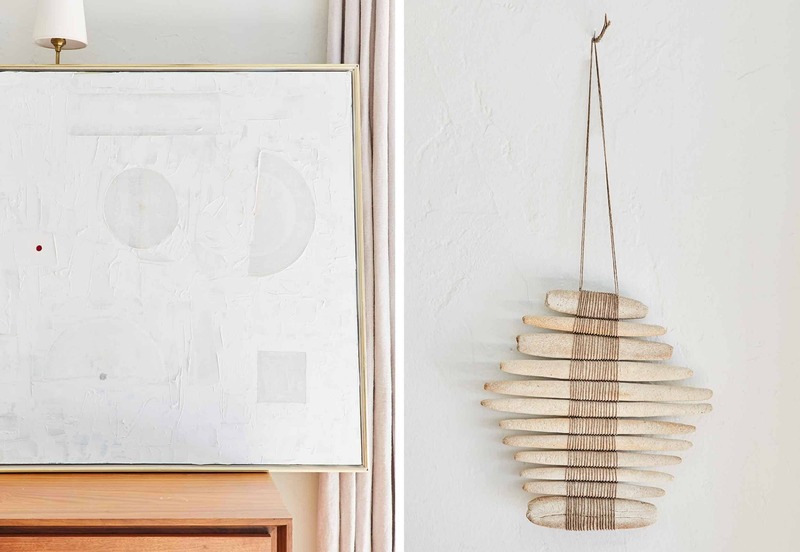 Amy Dov’s hanging sculpture reminds me of a mini version of Scott Horne’s hanging wood sculpture that everyone loves! The colors of that trunk are perfect, and even though it’s bashed a bit, it’s innards are in decent shape. Gotta tell my steamer trunk story. When I was in high school, the Antique Guild opened in the old Helms Bakery in Culver City. One of my high school friends got a job there. After she’d been working there for a while, they got in a shipment of steamer trunks. Turns out one of them was her grandfather’s from when he came through Ellis Island in the first decade of the 20th C. It had gone astray and was thought lost forever. They gave it to her, because what a story! And what better publicity, eh? Thank you! This is the Old Emily that I loved and missed! You have an amazing eye! By the way, where is that fabulous coat from? Yes, I definitely would splurge on this stuff if I had opportunity and motive (that is if I had a mountain house to fill, which I don’t). Love your haul. My fave things were the coffee table and the painting. 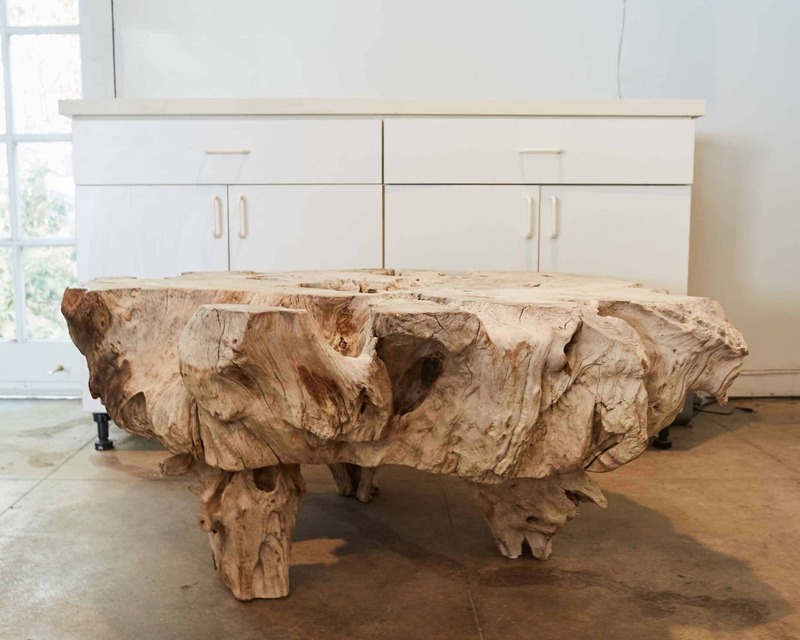 When I saw that coffee table, my first thought was, “It looks like the jawa sandcrawler,” and “If I were a kid, I’d have my little GI Joe action figures crawling and rappelling and hiding all over that thing!” Doesn’t it look like an alien landscape in miniature? For those who live far from the big city, I’d recommend etsy and ebay, and craiglist for furniture. You just have to look OFTEN. The fact that I don’t live in a big city means I’m more likely to find cool stuff REALLY cheap at thrift shops and antique malls. You just have to keep looking. For instance, when you’re on the road, make a stop at ye olde antique mall in another town! So happy your FMF post’s are back and as usual I love all of it (minus the steamer trunk, sorry). Love the Amy Dov piece (I’ve been eyeing her on IG and if I could, I would) and the pieces by Melinda Forrester. That lamp. Oh my, it’s very good. The chairs, yes please and that hunk of wood table?! I think I now need a mountain house just so I can justify a table like that. Another ceramic artist you might like is Phillippa Taylor on IG. I appreciate that you tell us what you paid. Thank you, Emily! #SCORE and LOVE the Melinda Forster. Hope she experiences more fandom from your post b/c she’s so lovely & whimsical. That i a seriously awesome trunk. I’d wish I could use it for travel, and then actually use it for my daughter’s dress up clothes. I really love this series of flea market posts, please keep doing them! These are all great finds. More than I would pay, because I’m a very frugal bargain shopper, but I don’t think the prices you paid are unreasonable for what you got. So many finds! I am surprised you aren’t sure about the steamer trunk. I think it’s a fantastic feature for the kids’ room: I see the color and brass accents fitting in perfectly palette-wise. The treasure drawers will be filled with craft supplies, small toys and dress-up capes, wings, etc. will hang on the hangers. The original art, sculpture and pottery pieces (new and vintage) are all wonderful. I always like to see you supporting local artists. The subtle colors and textures will bring a lot of warmth and depth into the design. Lastly, the upholstered chair and ottoman was such a bargain! I agree on recovering it in linen, yum! Everything is gorgeous and I love the flea posts ❤️ I recently sold that exact same trunk to a mama friend who was going to use it as a dress up trunk for her littles. That thing is huge and heavy and awesome. Can I ask a weird question? How do you get the smell out of flea market finds like dressers, armoires, etc? Such lovely pieces. Just wanted to mention to be careful with the trunk in the kids’ room. Not sure if they could close it themselves yet or in the future. But it’s exactly the sort of thing that kids would put themselves in and close each other up in playing hide and seek, and maybe get stuck or left in. Just wanted to mention maybe take caution or disable it from closing. More Flea market find posts please! Love the artwork by Amy Dov. You did good here, Emily! Love that vintage Emily is BACK!! The trunk is amazing!! I can see it easily being a dress up play trunk!! I love the table with all it’s oddity and inconsistency. I think it is also usable! LOVE THESE POSTS SOOO MUCH! Also, Can you add a glass top to the natural wood coffee table to make it more family friendly? You seem so rejuvenated! it’s great to have you back! Each item is so special. As I read I thought, “oh, I have to comment my love for that face sculpture. Oh, I have to comment about that dining chair… no, THAT dining chair. Oh wow, look at THAT one!” It will be fun seeing all these things turn up in the Mountain House! Awesome post – love your buys!!! +1 to more of these posts!!! And maybe those old trolling Craigslist ones?! EVERYTHING. I have a problem with chairs too. I couldnt love this more. Wow!! Wow!! Wow!! What a fantastic haul!! The Melinda Forster black lamp and smiling man piece are amazing!! I want and need both!!! What a fun Sunday morning for you!! 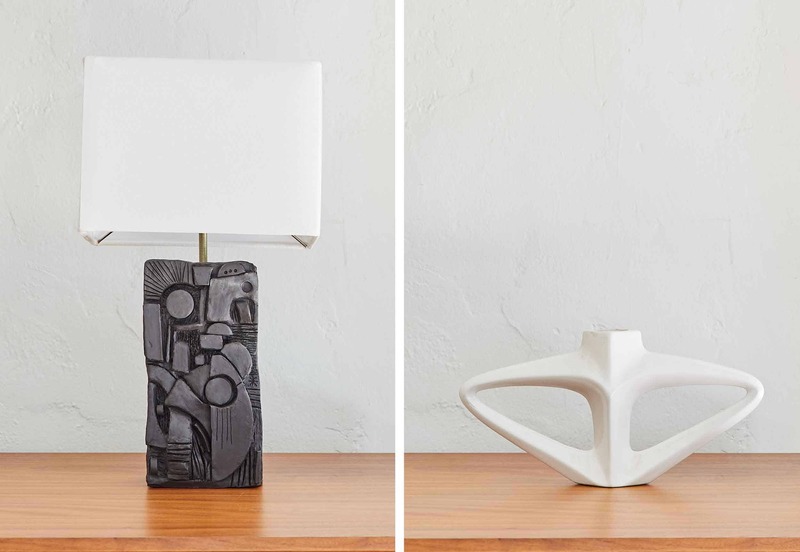 Would you divulge the price of the Melinda Forster lamp? It’s just so amazing. Love this post! Vintage furniture is my favorite. My house is full of it! I actually want details on your outfit! Could you post details on the cardigan and jeans, please? 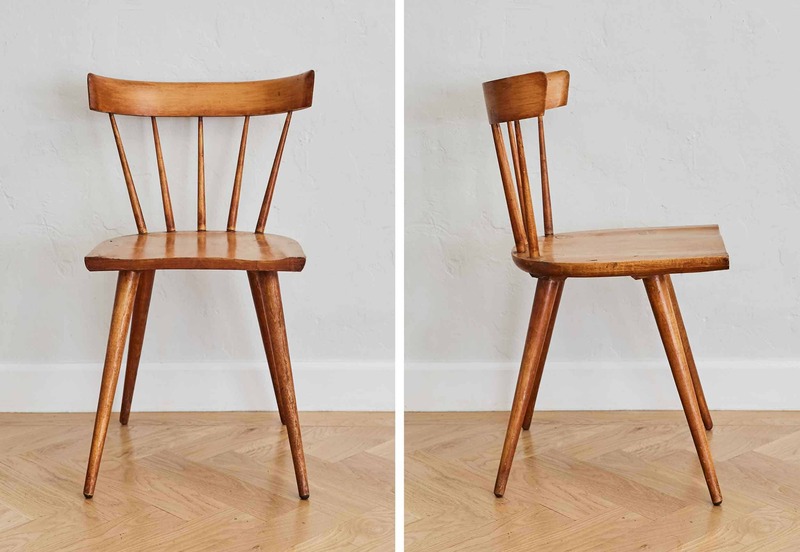 I am 99.9% sure that your “pretty, bucket-style Windsor chair” is a Conant Ball — I have this dining set, and while it’s usually mis-attributed to Paul McCobb, it was actually designed by Leslie Diamond. If it’s not original, it’s a very nice reproduction! I love these chairs and they’re super hard to find for a reasonable price. Well done!